Faxon Firearms has been quietly improving its ARAK-21 long-stroke piston-driven upper receiver for AR-15 lowers. The changes are all based on user feedback and help from experts within the shooting world. The company is also now manufacturing uppers in the most popular configuration — a right-handed 16-inch carbine upper with a medium-contour barrel and a matte black hard-anodized finish — in advance of orders so they can ship immediately. Faxon Firearms will continue to take custom orders for more patient customers who want an upper made to their own specifications. ARAK-21 uppers come in left- and right-handed versions, with a variety of colorful anodized finishes that really stand out in a world of drabs and flats. Faxon will custom-build uppers with the user’s choice of 16.2- or 20.2-inch medium- or heavy-profile barrels chambered for 5.56 NATO/.223 Remington or 300 AAC Blackout. Faxon Firearms started shipping left-handed receivers earlier this year. The ARAK-21 isn’t an AR-15 upper receiver in the traditional sense. It’s an original design that draws on AK and FAL concepts and puts them in a package to runs on AR-15 lowers. The upper is built around a modular, monolithic receiver. Not only can users mount accessory rails to the front of the receiver, the handguard can be disassembled and the barrel assembly swapped out in a couple of minutes. 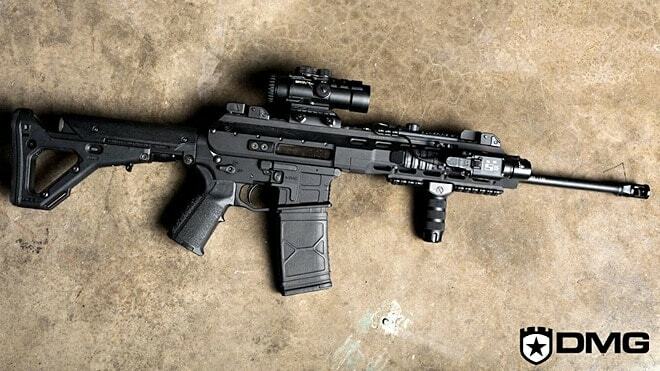 This allows the ARAK-21 to be quickly reconfigured with barrels of different lengths, profiles and calibers. The barrels are all stainless steel with a black nitride finish. Using what the company learned making barrels for the ARAK, Faxon now sells AR-15 barrels as well, at very competitive prices. Machined from billet 7075 aluminum, the new ARAK receiver features a handful of small changes and fixes to make it work with a wider variety of aftermarket bolt catch levers as well as changes to the bolt for improved ejection and reliability. Along with these changes come lower prices which are always welcome. The uppers now list at $1,199 and extra barrel assemblies are priced at $399. None of the changes have been major — the ARAK-21 still uses the same self-contained AK-style long-stroke gas piston system. Because the action is completely contained in the upper receiver ARAK-based firearms can be paired with folding buttstocks or no stocks all for pistol builds. 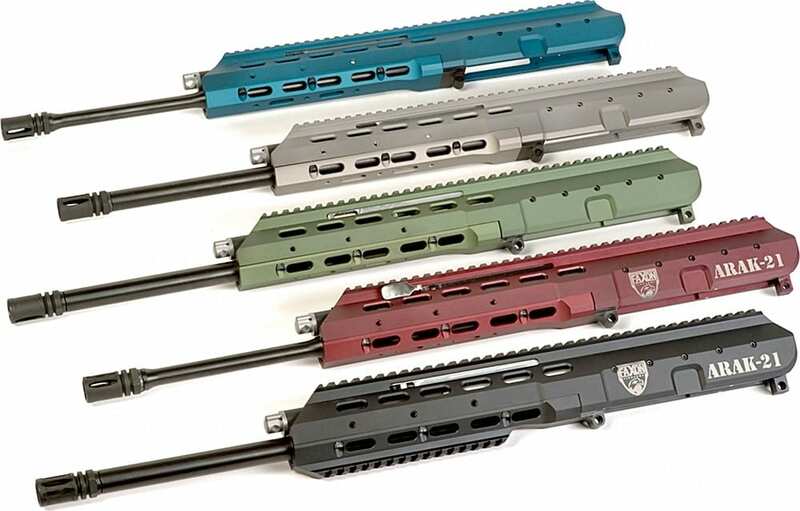 Guns and Tactics has the scoop on the changes, including the redesigned bolt catch cutout in the upper receiver, which was done largely in response to their feedback working with Faxon. What’s in store down the road isn’t set in stone. Faxon is collecting feedback from customers on what caliber barrels to offer next, and right now 7.62x39mm, 5.45x39mm and 6.8 SPC are on the table, as well as a .22 LR conversion kit. If you’ve been holding off on picking up an ARAK-21 until they got any kinks worked out of the all-new design now might be the right time. And they’re more affordable than ever. For more information head to the Faxon Firearms website and for up-to-the-minute news check out its Facebook page. There you’ll find out about all of Faxon’s little side-projects including their new crush washer-less muzzle devices.